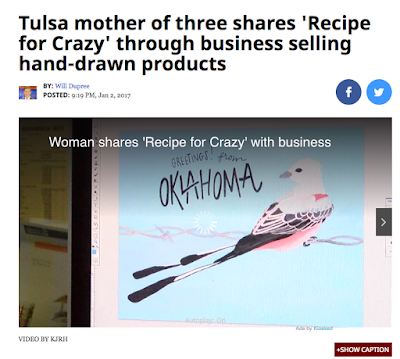 recipe for crazy blog: Recipe for Crazy is Oklahoma Brand this Week! Yesterday I shared a little peek into an interview I did with Will Dupree of Channel 2 news (KJRH) for his Oklahoma Brand series. Many of you asked to see the whole interview so here's a link to see me in all my awkward glory: click here. I really is such an honor to be able to share my story and I'm so thankful they thought of me! Being interviewed by the local news about my art?! So weird. And so cool.